Ayodeji Aderintoye: My name is Aderintoye Ayodeji Joshua, from Ondo state Ipogun town born in Ibadan and bred in Lagos. I completed my primary and secondary education in St. Saviours group of schools, Ijegun, Lagos. Presently I’m a cadet ASP (Cadet Asst Superintendent of Police) of the Nigeria Police Academy Regular course one (RC1), the pioneer set of the degree programme. Officialuniqueblog: Why your chosen profession? 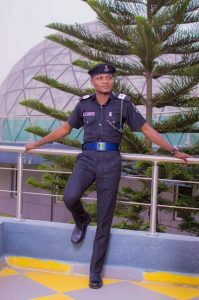 Ayodeji Aderintoye: My chosen profession because most things I like doing are embedded in it, i.e Serving my country, maintaining a tranquil society, reducing crime to it minimal level and most importantly changing the public’s perception about the Nigeria Police Force. Being a police officer gives me the power to enact these goals. Officialuniqueblog: Tell us about a major accomplishment you’ve made so far in your chosen profession. 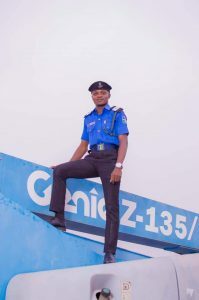 Ayodeji Aderintoye: As a cadet officer I’ve been able to make known to the public the best way I can via social media and other means of communication I’m opportune to that there’s hope and a great future for the Nigeria police force considering the fact that the Regulars as a whole are on the lookout for changes in crucial areas where the public has given up on the Nigeria Police Force. I’d say that the masses should be patient and wait for these changes to be evident. Officialuniqueblog: What do you do aside being a Cadet? Ayodeji Aderintoye: For now as a cadet, there are none but there definitely are plans for that in the nearest future i.e after my commissioning by God’s grace. Officialuniqueblog: Any regret so far? Ayodeji Aderintoye: Not at all. Like my Dad will always say “To be successful in Life, you’ve got to pay the price” so I wouldn’t call paying those prices a regret because at the end, it all gonna be worth it. Officialuniqueblog: An impression you will like to change about your field. 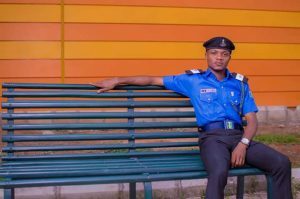 Ayodeji Aderintoye: Yes and that will be the public’s perception about the Nigeria Police Force. Officialuniqueblog: Tell us how you got into the academy. Ayodeji Aderintoye: I got to know about the startup of the academy degree programme through the print media. I filled all necessary information online and was stated to write the entrance examination which I passed and was invited for a screening and interview exercise which was held at the academy. It was actually my first time coming this far to the north; physical fitness exercise, certificate screening, medical screening, psychological test and oral interview were conducted. I passed all this stages and was shortlisted as a Regular Course 1 (RC1) cadet of the Nigeria Police Academy, Wudil, Kano State. Officialuniqueblog: How was the starting journey for you? Officialuniqueblog: What do you do to have fun? Ayodeji Aderintoye: I actually do a lot to have fun; singing, dancing, listening to music, playing drums, community policing, surfing the internet, watching/reading news, playing games, watching movies, driving, travelling, e.t.c. Trust me being an officer doesn’t stop you from having fun but when duty calls, leave fun and focus. Officialuniqueblog: Tell us about your future goals. 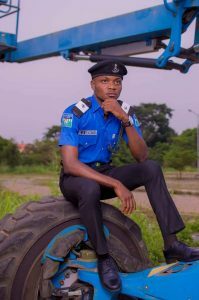 Ayodeji Aderintoye: My future goal is to become a successful police officer with the fear of God, full of integrity and with a difference. He’s truly an officer with a difference. Even amongst his course mates, he’s making a difference. Part of the few first class cadets and leading his department. I’m proud to know an officer like him. God bless you sir. Keep climbing brother… You can only get better! Nice one A.y,May God give you the strength to remain as a God fearing officer in order to maintain the your reputation.. I can see u becoming the IGP of Nigeria in the future and God will take there ijn. I trust God on your behalf bro..